Im Rahmen der Ausstellung "What a serious horror writing a play" findet am Samstag, 14. Mai 2011 um 19 Uhr die Performance "A lecture on my face" von Fabienne Audéoud statt. "In May 2000, the London police called and asked me if I knew Josef Kramhöller ... It was not the first time, but then, they couldn't tell me on the phone what had happened ... I went to the bathroom trying to get ready to go somewhere, maybe to the hospital. And I looked at myself..."
Mit hunderten von Selbstporträts, die in über 15 Jahren entstanden, und einem Video des tanzenden Josef Kramhöllers bezieht sich Fabienne Audéoud in der Performance auf ihre Erfahrungen nach der Nachricht vom Tod ihres Lebensgefährten. Aufgeführt in: Jan van Eyck Akademie Maastricht, South London Gallery London, Konstakuten Stockholm, Platform Garantie Contemporary Art Center Istanbul, SMART Project Space Amsterdam, Ormeau Bath Gallery Belfast. Ausgezeichnet mit dem Ormeau Bath Gallery Award, 2001. Im Anschluss an die Performance diskutiert Helmut Draxler (Professur für Ästhetische Theorie an der Merz Akademie Stuttgart) mit Franziska Hufnagl, Florian Hüttner u.a. zum Thema "Die Bedeutung der Münchner Kunstszene der 1990er Jahre"; moderiert wird die Veranstaltung von Axel J. Wieder (Kurator und Autor, Berlin). 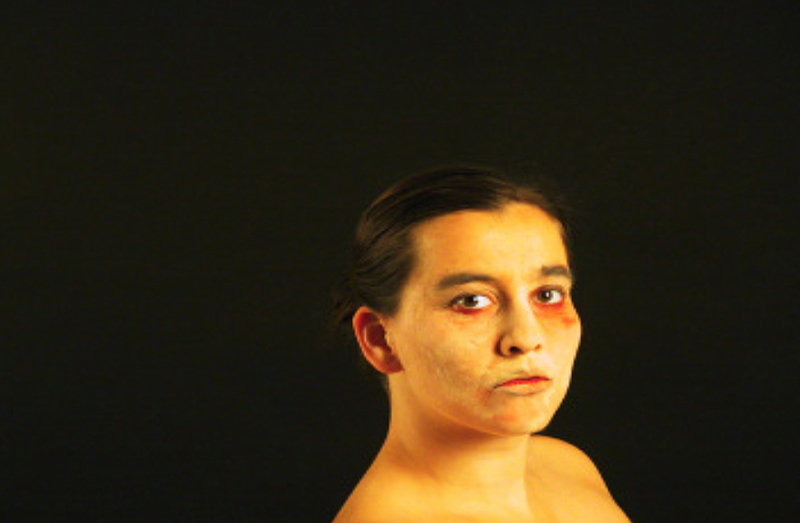 In context with the exhibition „What a serious horror writing a play“ the performace „A lecture on my face“ by Fabienne Audéoud will take place on Saturday 14th of May 2011 at 7pm. With hundreds of selfprotraits taken over the past 15 years and a video of a dancing Josef Kramhöller, Fabienne Audéouds performance relates to her experiance after receiving the news of her deceaced partner. Following the performance Helmut Draxler (Professor of aesthetic theory in art at Merz Academy, Stuttgart) Franziska Hufnagel, Florian Hüttner and others will discuss the topic „The meaning of the Munich art scene in the 1990’s“.